The global maritime industry faces myriad challenges in the ongoing quest to run safe, profitable operations in an oftentimes tumultuous environment. More than ever vessel owners are faced with daunting regulatory and technical challenges, and the world’s leading classification societies remain the foundation upon which successful marine operations are built. 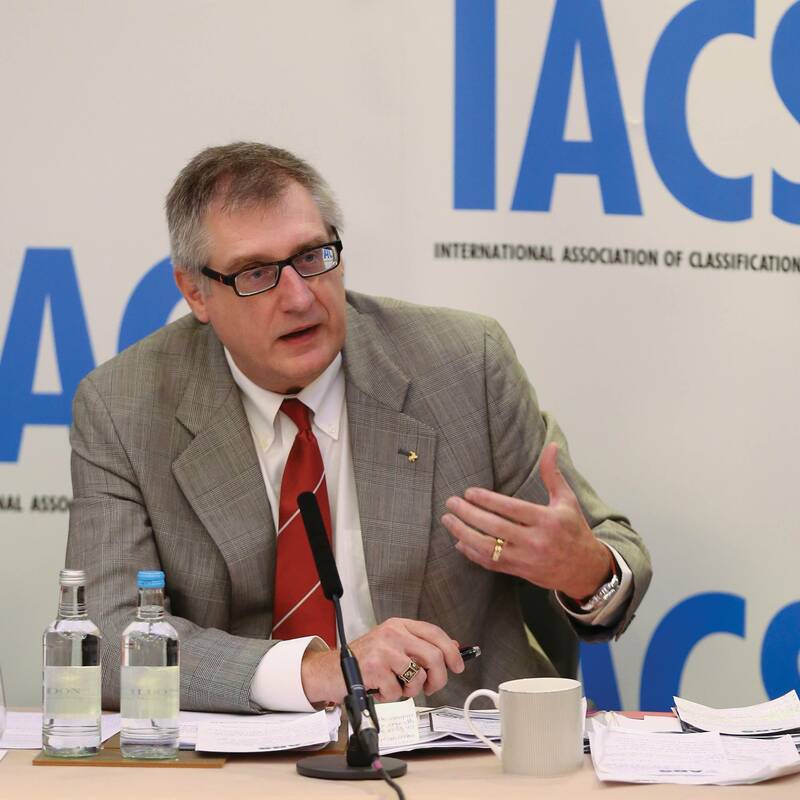 Last month we visited with Christopher J. Wiernicki, the head of ABS and the newly elected head of the International Association of Classification Societies (IACS), for insight and analysis. I’m sure when you assumed the mantle of leadership at ABS, you had goals. Can you share with our readers your goals from the outset, the progress that has been made in achieving them, and how they have changed during your tenure at the top? 1. Align the organization around the seven core values that represent the Spirit of ABS and support our mission. These values are safety, teamwork, innovation, integrity, quality, reliability and a focus on people. 2. Establish ABS as the technology leader driving Class of the Future. 3. Be the most efficient provider of quality and responsive class services. 4. Embrace a workplace safety leadership mindset focused on employee safety behavior. 5. Position ABS for the future to compete on value by making strategic investments in people, systems and technology. As with any strategic agenda change comes with time but we are making tangible progress in achieving these goals so far. I see our global workforce aligned around our objectives and responsive to the needs of the industry. We are aggressive in our pursuit of technology leadership. Class of the Future continues to evolve and we know advancing predictive, data-driven analytics is essential to this. We have invested in R&D initiatives that will further these goals. Through our robust technology program in Houston and in five additional technology research centers around the globe, we are funding some of the most innovative research in the industry. We are moving forward with ground breaking nanotechnology research in icephobic surfaces for improved Arctic safety. This year ABS is advancing more than 150 research projects. Our stature as the provider of class services speaks for itself. In 2014 we added more than 15m gt to the ABS classed fleet from 2013. This was due to a combination of new vessel deliveries and Transfer of Class Agreements which alone brought in a net total of 5m gt to the ABS fleet. In total, the ABS fleet grew by more than seven percent year-on-year. In the challenging economy of 2015 we continue to hold strong and continue to maintain the leading new order market share amongst our competitors. A workplace safety mindset is in place as we see positive movement in key indicators including a reduction in lost time incidents. We closed 2014 with 2 LTIs and remain focused on hitting our target of zero this year. We continue offering technology to improve safety through software quality management. This year ABS achieved an industry first when we rolled out the important ISQM notation and the first drillship was delivered with this notation. No other classification society has classed drilling equipment and essential marine equipment with a software notation addressing software quality during construction. We are strategically investing and developing next generation work flow platforms that will enable our people to unleash their creativity and knowledge and significantly improve efficiency and response time. Bringing new tools to our engineers and surveyors and optimizing the way they work. Positioning ourselves for sustainable success remains a priority. We’ve expanded our training and development offering. Earlier this year we launched “Blue Print for Your Future” a program for developing our talent in areas ranging from technical expertise to team management. We continue to build on our strengths to ensure that we retain our competitive edge. While the marine industry is no stranger to strong cyclical pulls, many sectors continue to struggle from the financial crisis of 2008 and now the precipitous drop in oil prices over the past 16 months. How do these strong cycles affect the role and/or the activity of class? ABS has been a mission-driven organization for more than 150 years, so we have seen our share of shipping cycles. What is important to remember is that irrespective of market conditions, our focus is on our mission. That is an uncompromising constant, and it is what dictates everything we do. We understand also that what will sustain us is continued investment in our people and the systems the industry will require. Cycles are temporary but our vision is long term—develop our people and the bright minds of the future, build the “state-of-the-art” systems and solutions the industry requires and nurture the future with a commitment to R&D. I have tried to regulate the amount of pressure on our organization to achieve this balanced approach and allow us to see beyond the industry cycles. We focus on identifying practical solutions that allow safe operations to be maintained and that help our clients comply with the rapidly shifting regulatory environment in which we find ourselves. Today ABS is overseeing more than 150 maritime and offshore technology projects that will help identify, test, and bring to reality innovative concepts that impact safety, asset operations, and environmental responsibility. These include technologies that are already coming into the mainstream such as environmental and operational efficiency applications and the use of alternative fuels such as LNG. The next generation of maritime technologies, including ice-phobic coatings and tools to enhance cyber safety and systems integrity, are in development at ABS. 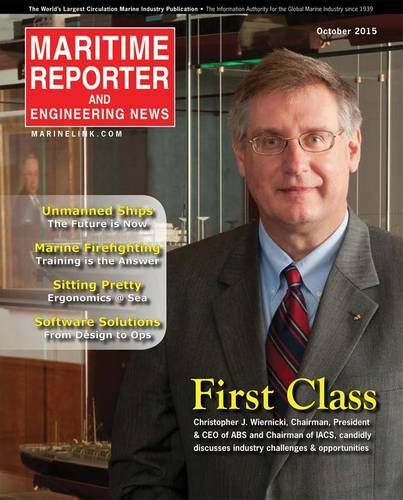 How has class adapted to meet growing challenges to ship owners? Owners are facing multiple challenges today that span an unbelievably broad spectrum – from the economic landscape in China and a global energy map redrawn by U.S. shale production to the global economic slowdown and the rapid development of new and untested technologies. In the face of this uncertainty, there is also a need to meet an increasingly complicated and accelerated regulatory timeline and to improve operational efficiency. For owners to compete, they need support in managing ever-increasing technical risk. Additionally, as regulations around emissions such as NOx, SOx and CO2 are set to take effect and the question of Ballast Water pervades the marine industry, there is a definite need for guidance. Successfully navigating this landscape is going to require a new generation of technical leadership from Class with an appreciation and heightened awareness of technical risk. Greater input into techno-economic decision making without compromising safety will be important. ABS has invested in the developing the technology to help owners in managing this risk and support them in making choices regarding their assets with all the information in their hands. Techno-economic modeling goes beyond technical evaluation of energy-saving measures by providing owners with a fuller understanding of the positive impact of embracing the use of environmental and energy-saving devices. I also see an emphasis on risk-based and predictive-based class roles that can keep up with the fast-paced technological development. Recognizing the importance of data analytics and cyber safety as the foundation for the next generation of safety systems is key. Big data is the substance that ties together regulations of the future, technology advancements, and Class of the future. I believe Big Data will enable enhanced decision-making, insightful discoveries and process optimization that will create a safer and more efficient industry. Equally important is providing owners with the tools and knowledge to make the necessary choices for the long term. Today’s regulatory environment is rapidly shifting and the cost of compliance is putting pressure on owners as never before—impacting future capex and long term sustainability. Class has had to become far more proactive in recent years. At ABS, this means taking a holistic approach to the role of defining safety, operational efficiency and compliance with environmental regulations. This is essential to maintaining the confidence of industry and to ensuring that the role of Class remains in touch with rapidly changing industry needs. As the marine and oil and gas industries evolve, so do the expectations for Class services. While, for example, bridge technology is better than ever and our ability to track and monitor assets at sea is without compare historically, ships continue to collide; while technology and accrued knowledge to build ships stronger, ships continue to break: What is being done, or should be done, to address the number of “human factor” incidents in the marine environment to reduce casualties? ABS has a unique perspective on this issue because we work at the interface of technology and the human factor. There is no question that new technology and increasing use of big data will reshape and transform the way we think and work. But I think the real value of big data will come from its secondary usage not just its primary applications. ABS focuses on the critical role of the human element as the root of effective safety standards and practices. The ABS Safety & Human Factors Group is working on the ergonomic design of marine engineering spaces, and providing guidance on other technical aspects of the onboard habitat to assist industry with safeguarding the human element in maritime and offshore environments. We play an important role in setting a benchmark for monitoring personal safety at sea through the Mariner Personal Safety project, which is a collaborative effort between ABS, Lamar University of Beaumont, Texas and maritime industry partners around the world. The ISM Code already requires owners to track injuries and close calls so the question we wanted to answer was whether companies would pool the information they had already collected. Its objective is to create a large international database of injury and close call (near miss) incidents which can be reviewed and analyzed to identify trends, possible causes, and potential lessons learned. It is time to change industry’s view of Human factors in shipping. There is a growing recognition that safety culture is key to the most familiar, concrete goals of business: efficiency, productivity, quality and profitability. Integrating Human Factor design practices and principles that reflect human capabilities and limitations can result in installations that are more cost-effective, safer and easier to operate and maintain. We cannot ignore the importance of the human in the Big Data and technology reality. At the end of the day it is the common sense, innovation and creativity that people possess that prevails and defines this new Big Data reality. You recently took the helm as IACS chair, and I understand that IACS will release a document with an updated IACS strategy. Can you share with us the overview content of these updates? The IACS strategic plan addresses both the current and future needs of the shipping industry by focusing on three key areas: structural, machinery and cyber system integrity. On the IACS website specific initiatives are listed and topics addressed range from human factors to Energy Efficiency Design Index (EEDI) to LNG Bunkering and continued research on whipping of container ships. Priorities for 2015-2016 strike a balance between the completion of ongoing projects and the need to look forward and formulate the next generation of IACS guidelines, unified and procedural requirements, addressing existing and emerging challenges. One of our top priorities is the completion of the IMO Goals Based Standards Process in manner that is technically sound and responsive. Looking at emerging issues facing the industry, I believe IACS needs to clearly establish a role in cyber safety. Individual class societies already are working on this most pressing issue, and IACS formed the Expert Group Cyber Systems in 2015. The group’s scope and terms of reference includes examining design and architecture, construction evaluation methodologies and certification, testing/commissioning processes and whole-of-life procedures for monitoring, maintenance and performance management. From this – and looking at best practices from other industries – IACS will develop unified requirements for design, manufacture, installation, testing and commissioning of such systems. The final item on the agenda is the IACS relationship to IMO. In my opinion, many people do not understand the amount of effort IACS and its members put into supporting IMO. IACS Council has re-dedicated the organization to continuing this course and enhancing it. I think it’s fair to say that nothing speaks more to IACS’ dedication to IMO than its continuing ongoing participation in the process and communication with the IMO staff. In the coming year we plan to further strengthen our relationship with the IMO and work to raise awareness about our dedication to the organization and its goals. In your experience, what has been the greatest contribution of IACS to the overall functionality and operation of class? The greatest contribution of IACS derives from its core purposes. The purpose of IACS through its member classification organizations is three-fold. First, recognize address and cultivate safety-related issues dealing with structure, minimum standards, and cyber safety. Secondly, to facilitate the development and implementation of minimum safety standards and ensure they are applied consistently. Finally, IACS serves as an independent technical advisor on safety-related issues to both IMO and the industry. IACS plays a role that no other industry group can fulfill – an independent advisor to IMO and the industry. The technical knowledge it brings to bear is second to none. The strength of this relationship has enabled many contributions to the industry—it’s enabled IACS to develop Common Structural Rules (CSR). For nearly a decade now CSR has been in place and is helping to drive a safer and more uniform shipping industry. In the case of container ship safety, IACS has responded to the industry’s needs after the MSC Napoli and the MOL Comfort incidents. IACS assembled expert teams to develop a set of Unified Requirements which defined and ensured minimum requirements relating to Container Ship safety. Requirement S11A addresses Longitudinal Strength Standard for Container Ships and S34 focuses on the Functional Requirements on Load Cases for Strength Assessment of Container Ships by Finite Element Analysis. During your tenure at the helm of IACS, what do you hope to achieve? As the newly elected IACS Chairman, I have defined three forward-looking strategic areas to be the focus during my tenure: completion of the Goal Based Standards, position IACS for the future and stand up a Cyber system integrity program to complete the 3rd leg of the safety stool mentioned earlier. These initiatives will define the next generation of guidelines, unified and procedural requirements and solutions to existing and emerging challenges and help ensure long term viability for IACS to meet the future needs of the industry. IACS has put in place a structure that provides consistency of implementation by its members of CSR and will continue to support members so that they achieve that consistency in their own rule application. The IACS Council is committed to providing resources needed to complete the Goal Based Standards process and this is being done in a structured manner, which will demonstrate rules are compliant. We look forward to completing this process in the coming year and believe the resulting requirements will extend the current safety record and possibly enhance the safety margin. Defining IACS role in cyber safety issues is a priority for me. The future of class and the next generation of maritime regulations are going to be driven by data to a degree that has never been seen. With more data comes the risk of data security and the need for consistent verification and validation of systems and subsystems, periodic cyber safety risk assessments, and a consistent approach to capturing lessons learned. Drawing on best practices from other industries, IACS will develop unified requirements for the design, manufacture, installation, testing, and commissioning of such systems. My commitment to IACS is to ensure the organization continues to be the “gold standard” for classification society performance and position it for the challenges of the future. Through teamwork, technology, and a legacy of safeguarding industry, we will demonstrate continuous vigilance with an eye on safety, quality, and environmental protection. Reflecting on your career to date with the American Bureau of Shipping, what do you count as your greatest success (or mission accomplished) that you find most gratifying? I’m proud of the many accomplishments ABS has seen during my 20 year career here. I have had the honor to have been part of many “firsts.” I think the biggest success – in general terms – is how ABS continues to capitalize on its foundation as a technology-driven organization while growing and developing a global team that is aligned behind our core mission. The ability to apply core engineering and technology knowledge together with our cumulative experience continues to be a key differentiator in developing practical and innovative solutions that help industry move forward. Our impact across the industries we serve is clear when looking at the chronology of milestones in which we’ve played a role. Our long history in classing marine assets includes classing the first containership in 1956 and the first purpose-built containership ten years later. And our leadership in this area continues. We classed the world’s first ultra-large container ship in 2006, in 2011 ABS was selected to class the series of world’s largest containerships, and in 2015 ABS-classed the world’s first LNG powered containership. 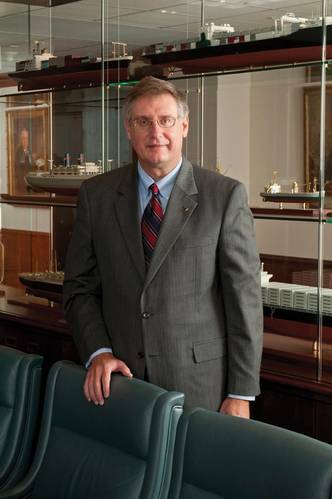 We’ve had similar successes in every segment of the maritime industry. I think we can say we are also the front runner in the gas sector. 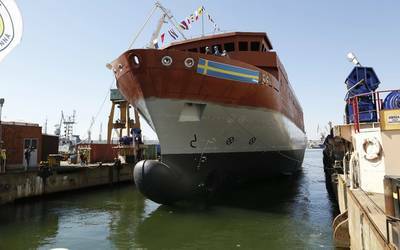 In 2012 ABS was selected to class a dual fueled LNG-powered offshore supply vessels, this OSV began service in the Gulf of Mexico in 2015. We’ve led in gas carrier classification from the outset, classing the first LNG carrier in 1958. And just last year, we added the world’s first VLEC as well as an FLNG vessel built for use offshore Malaysia. In offshore, we have been involved in every barrier-breaking technology in the industry and have claimed an industry leading position in all sectors. We classed the first mobile offshore drilling unit in 1958, and we’ve been first to class nearly every type of production unit, including spars, tension-leg platforms and semisubmersibles. Most recently ABS granted AIP for a next-generation drillship design, which operates in 12,000 ft water depth and can accommodate a 20,000-psi BOP system. Anyone would be proud to lead an organization with this track record. I take a great deal of pride in ABS and how we continue to set the bar for performance. We’ve made history time and again with achievements that put our organization head and shoulders above the competition. But with all these achievements it is our people that stand out for me. 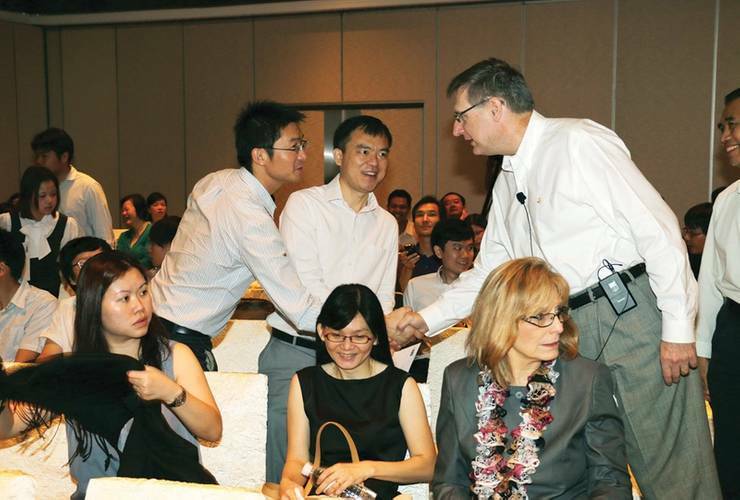 I am fortunate to head up a group of ABS employees who are passionate about the work they do. I take great pride in watching the accomplishments of this team and seeing the embodiment of the spirit of ABS and the seven core values – safety, teamwork, innovation, integrity, quality, reliability and a focus on people – exemplified in each of them daily. I am proud of our past, but I’m dedicated to our future. We are forging a path today that will continue to place us in a class by ourselves. We are introducing new ways of working, and in the end, we are redefining class without redefining the safety mission class is built on.